This may come as no surprise to a few of you who read Bec Crew’s blog post on Scientific American’s website a few weeks ago but there is such a thing as book scorpions. Yes, you’ve read correctly: book scorpions. They are real, unfortunately. I discovered their existence this morning while catching up on emails. I’m way behind. I’ve subscribed to one too many newsletters. I think it was while reading a newsletter from Shelf Awareness that I found a link directing me to Crew’s blog post. My morning was going great until then. One of my biggest book peeves is bugs that eat books and while I should love book scorpions since they feed on such pests, their appearance is not one I would be glad to see. 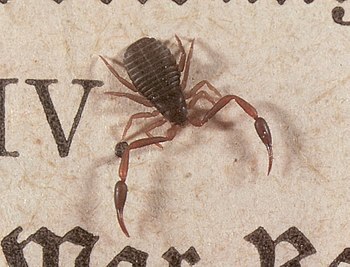 According to Crew, book scorpions, properly known as pseudoscorpions, are tiny insects that hunt booklice and dust mites that feed on the starch-based glue used to bind books. Like a scorpion, they have long, pincer-like claws protruding from their sides called pedipalps that are twice as long as their legs (I wonder if they ever get tired carrying those around). The one thing I found cool about these bugs is that their respiratory organs are called book lungs because they “look just like the warped pages of an old book.” They’re more bookish than me.